DIMENSIONS (LxWxH)..................... 26" x 14" x 29"
FOR SAFETY YOU MUST HAVE ONE HAND ON THE MOTOR SWITCH AND THE OTHER PULLS THE ICE PUSHER HANDLE DOWN TO ENGAGE THE SPINNING SHAVER HEAD. A cool treat on a hot day! Great for use at family reunions, school picnics or a birthday party! Don't forget the syrup and cups! 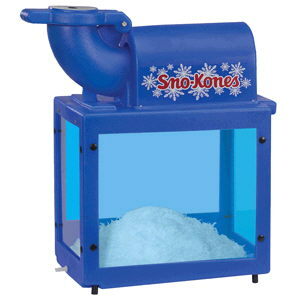 ** Please call us for any questions on our sno cone machine rentals in Fairview Heights IL.